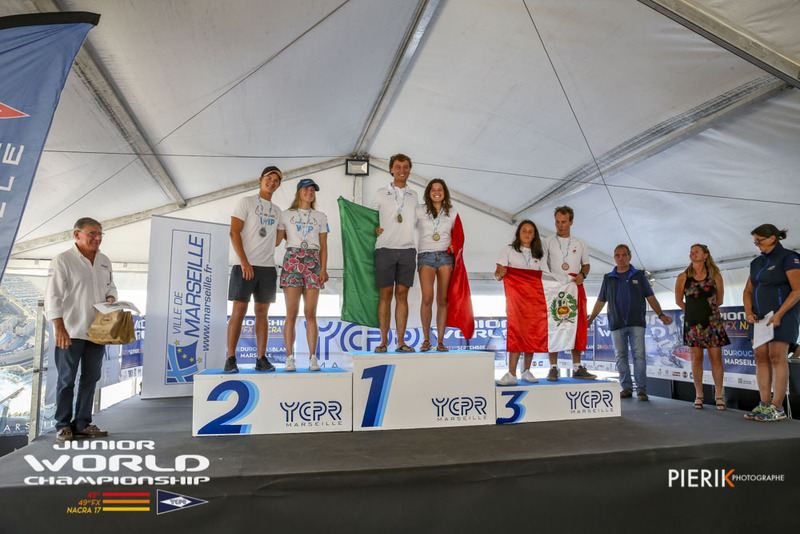 Gianluigi Ugolini & Maria Giubilei (ITA) just won the 2018 Junior World Championship for the Nacra 17! They won the only race today, ultimately winning 6 of the 7 races that were run for the Nacra 17 and were clearly the class of the field. Upwind the racing was typically quite close, but the Italians had a read edge downwind, and the only race they didn’t win was the first super windy race of the regatta. Their dominance is even more outstanding given they are both U21 sailors, and therefore have two more years of eligibility at the Junior level. The Federazione Italiana Vela, Italian National Team, clearly has something to be proud of in their Nacra 17 fleet. 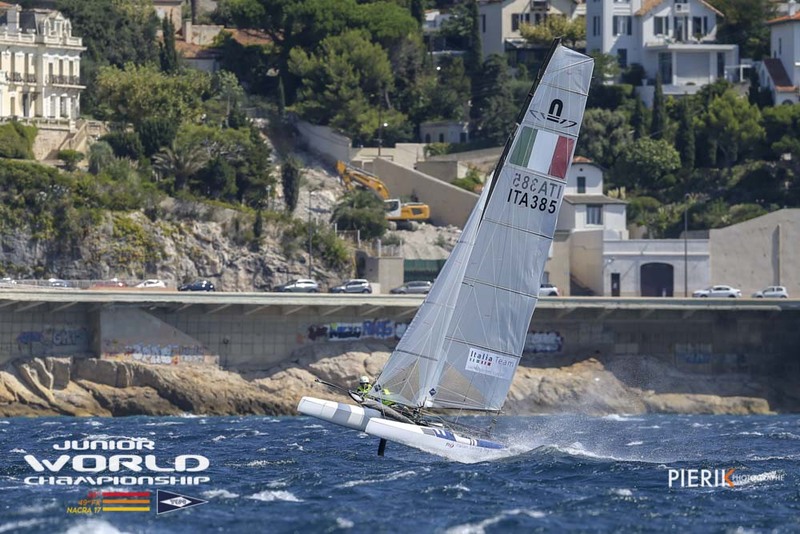 Italian sailors have now won all three major titles in 2018, Worlds, Euros, and Juniors! World Sailor of the Year candidates, Ruggerto Tita and Caterina Banti took a clean sweep of the season, winning every regatta they entered. The Nacra 17 fleet was small here in Marseille, with the championship not yet established and a few of the younger teams off in Japan, but it is certainly diverse! The eight boats come from seven nations and four continents. Tayla RIETMAN and Lachlan WHITE (AUS) were the only team to take a race win from the Italians, and relished the strong home-style conditions. “We’re so happy to be here in warm and sunny Southern France. Back home it’s a bit rough right now, so any chance to get out and race in such great conditions is fantastic,” said Tayla! In third place were Javier ARRIBAS HARTEN with Adriana BARRON (PER), representing the team farthest away from home, battled hard and were very happy with their racing. Peru is hosting the 2019 Pan Am games and they plan on racing there and continuing on with their campaign, picking up the Peruvian 49erFX team to travel and work with next season. This wraps up the 2018 Junior World Championship in Marseille France. The championship will be remembered for it’s challenging conditions, huge fleets, and for the highly competent hosts. With Mistral conditions for the final three days, these teams have shared in the common challenge of being pushed to the limit by conditions in racing that matters. 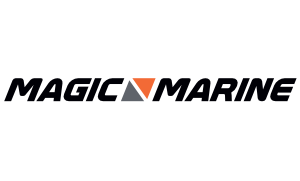 There is no doubt that years from now, when these teams are less fresh and young than today they will still be swapping stories of the hard ways they learned to get around the course here in Marseille. If the Olympic regatta upcoming in 2024 needed to be run next month, this group could pull it off. Over 100 skilled and experienced volunteers run a base that is set up well for dinghy racing. At the opening ceremony the athletes were promised a completely transformed host venue, and no doubt there will be extensive work done, but the bones of the place are fantastic, as are those that run it. 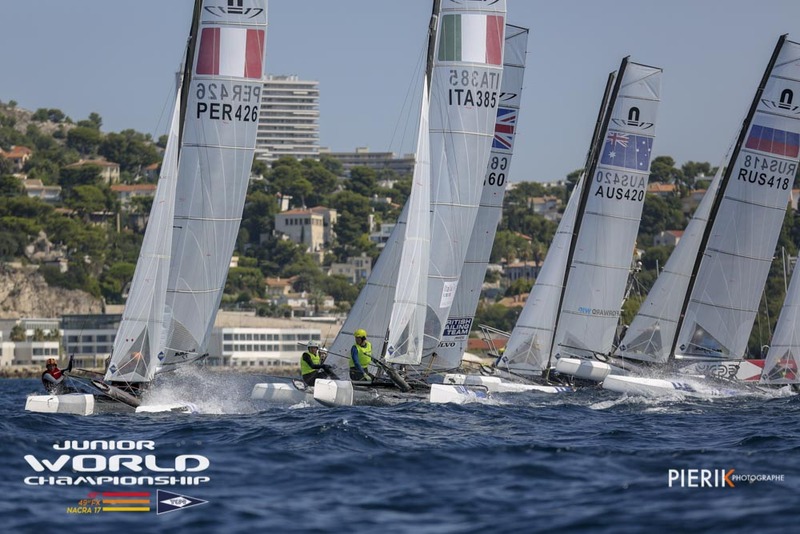 The 2019 edition of the Junior World Championship will be in Risor, Norway in the week following Kieler Woche.The senior age sailor in 49er are about to begin the Test Event and Sailing World Series Enoshima at the 2020 Olympic venue in Japan.